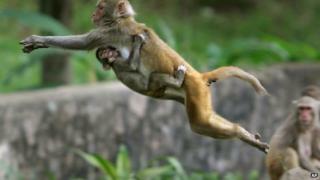 A monkey in the northern Indian state of Himachal Pradesh has rained down banknotes on people, reports say. Surprised holidaymakers in the scenic pine forest of Shimla, the state capital, ran around, collecting the falling notes for nearly an hour on Sunday, eyewitnesses said. Reports said the simian stole 10,000 rupees ($165; £100) from a nearby home. The monkey had entered the house to look for food, but when it did not find anything to eat, it took the money. There are some 300,000 monkeys in the state and Shimla has long been a haven for the animals. Macaque monkeys are considered sacred by Hindus, who often feed them. But in recent years, the animals have been coming increasingly in conflict with humans, destroying crops, attacking people for food and biting children. And authorities in Himachal Pradesh have declared monkeys a menace. The cash-dispensing simian was first spotted sitting on a tin roof with a bundle of currency notes before it playfully started throwing them down one-by-one. As people began collecting notes of various denominations, the monkey moved on to a tree. But as it continued to distribute money, many people rushed there to pick up the falling notes. "Surprised by the attention it was attracting, the cash loaded monkey then decided to move into the thick pine trees. But as it continued to shower notes, the money collectors naturally followed it," said Amit Kanwar who witnessed the entire scene. This is the second such incident in Shimla this year - in February too, a monkey stole a wad of currency notes from a home and distributed it among people on a crowded street.